Tom Beasley with Spanish olive jar from seafloor near Langara Island. Source: Northword Magazine. One great thing about not keeping up with a blog is so much stuff accumulates like lint in the internavel that it is easy pickings to get material to post . . . . for example, the not very well known discovery by a fisherman of a Spanish colonial olive jar fragment in the waters off northern Haida Gwaii. There is a nice summary by Jane Stevenson of the find in a 2012 issue of Northword Magazine, and much more information in an open access 1992 article in BC Studies. Autonomous Underwater Vehicle on surface of Juan Perez Sound, Haida Gwaii, with Parks Canada support vessel behind. With sea levels rising by at least 120m globally at the end of the last ice age, conventional archaeological wisdom has been that sites on ancient coastlines are now deeply drowned. As is so often the case, conventional wisdom is over-simplified. The B.C. coast is a good example, since the effect of ice weighting in some places counterbalanced the lower sea levels, meaning significant chunks of the coastal plain and paleo-coastlines were never-drowned. Nonetheless, the underwater environment off the west coast doubtless contains thousands of early-period archaeological sites. Looking on land is more convenient, easier, cheaper, and allows one to breathe air – all good things. But looking underwater has some attractions too: methodological challenges, modelling issues, thinking about human life on a shrinking landmass, and a ridiculous amount of media coverage. The last is particularly important to University Administrators. Anyway, this month’s ASBC Victoria talk (poster, PDF) is on a project from a couple of years back which focused on attempting to find a particular kind of archaeological site on the sea floor: drowned fish weirs, especially rock wall ones, starting from the premise that such sites, which are often substantial in size, should be confined to stream channels and might be directly visible to sidescan sonar. For more information on the talk, click below. Cache of early 19th century Russian Axe Heads, on Kruzof Island, Alaska. Source: Dave McMahan via NSF. 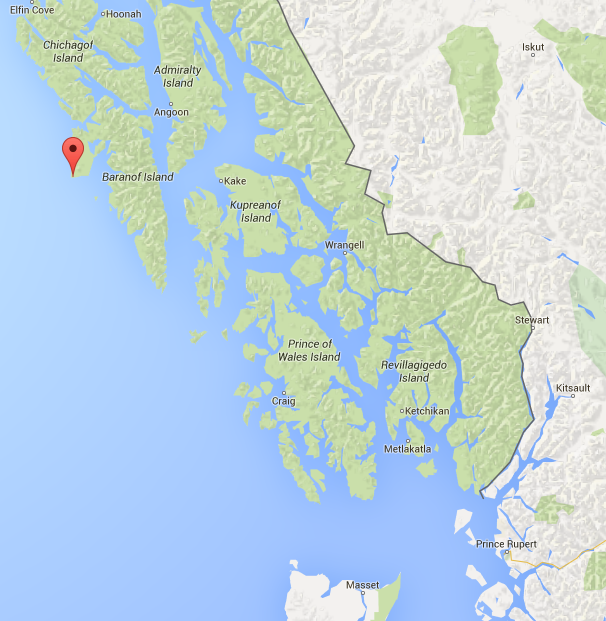 In late 1812 or early 1813, the London-built, Russian-owned frigate Neva foundered on rocks somewhere near Sitka Sound, in Tlingit territory on Baranof or Kruzof Islands, SE Alaska, (map). The Neva was a prominent ship of Russian colonial Alaska having, for example, taken part in the 1804 Battle of Sitka as well as making multiple round trips during the maritime fur trade hauling sea otter pelts to Chinese and Russian ports. The actual wreck site has never been found. However, in 2012 archaeologists led by Dave McMahon and the Sitka Historical Society found a small historical-era site which they thought might be where the 28 survivors of the wreck sheltered for a month before being rescued in January 1813. An intriguing and suggestive find in 2012 was an apparent cache of Russian made axeheads (above), suggesting further work was called for. In 2015, a fuller excavation took place finding a remarkable assemblage “focused on survival”, not at all typical of early historic settlement sites. So, while there is no smoking gun yet, such as crockery with the Neva’s monogram, there are plenty of indicators that this site is where the survivors sheltered in the not-entirely benign Alaskan winter while awaiting a rescue that might never come. A while back I found the cool picture above in an online exhibit of the Whatcom Museum showing photographs of Point Roberts and Lummi Island, on Puget Sound just south of the Canadian border. 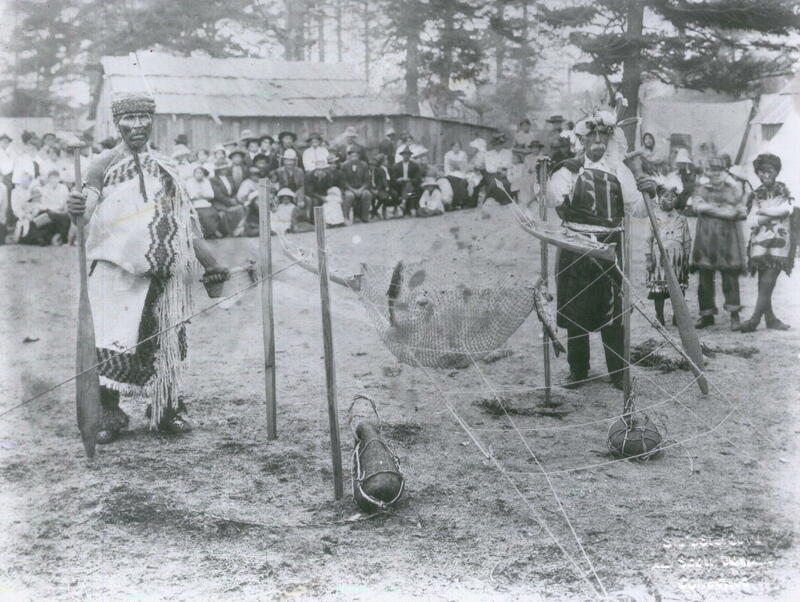 Reef netting is a peculiarly Straits Salish technology which involved the setting of complex nets, suspended between two canoes, at strategic locations where the natural flow of salmon was constrained. A sort of on-ramp led the fish up to the net by creating a gentle optical illusion of a rising bottom. When the salmon were milling around in the horizontal net, still free, the canoes would be suddenly swung together, closing the net and trapping the salmon. So, it’s been a while without a post here so apologies to compulsive page-refreshers and lonely groupies. I see lots of interesting comments – I’ll try to get caught up soon. For now, here is the announcement about the Victoria ASBC meeting coming up this Tuesday. It’s great to see that there is going to be some dialogue between the ASBC and the UASBC – two solitudes far too much of the time. 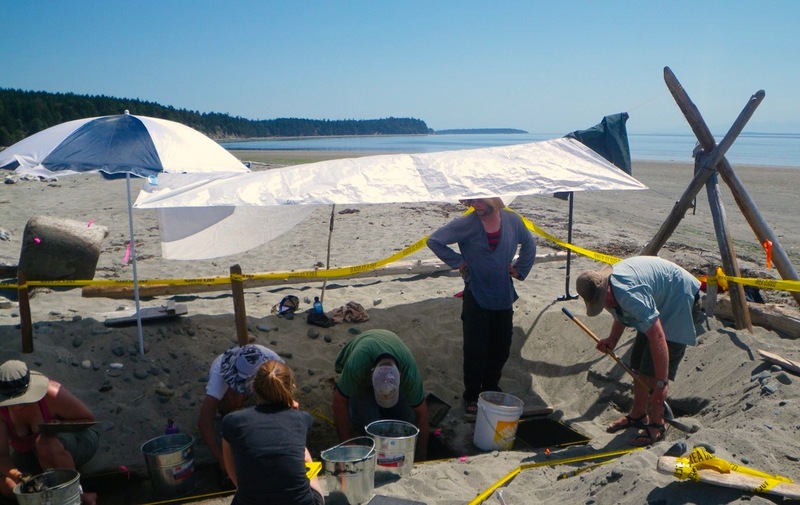 Parks Canada - UVIC Archaeological Project in the Intertidal Zone, 2010. Abstract: Recent investigations in the Gulf Islands National Park Reserve included a focus on the intertidal zone. Analyses of cultural and paleoecological data obtained from these investigations has resulted in a more detailed sea level history for the area and, discovery of a suite of archaeological sites associated with sea levels slightly lower than modern. These now-intertidal sites include intact shell middens and apparent house features dating as early as 4,000 years ago. 3-D Sonar Scan of A.J. Goddard historic sternwheeler from Yukon. Source: Montreal Gazette. A year or two ago, the well-preserved wreck of the Klondike-era paddlewheeler A.J. Goddard was found in Lake Lebarge on the Yukon River. The find (which is now protected) got a lot of attention because of the ghostly images (click on the very high resolution pop-up ones here) as much as the historical significance. The wreck was recently in the news again because divers had found some vinyl phonograph records which had the potential to be played. Listening to the music of the dead crewmen of a ship evocative of the Cremation of Sam McGee would create close, perhaps emotional, connection with these poor unfortunates. Being made of stern stuff (heh) what I am more interested in is the intriguing sonar image (above) that accompanied the mainstream press coverage. The phonograph is cool, but archaeologically the more significant development are the new technologies being used on wrecks in general and some Yukon wrecks in particular. I found more images and a very short article at Wired magazine and they are worth a look, as is much of the background info from the Institute of Nautical Archaeology (INA), which includes a photo gallery. 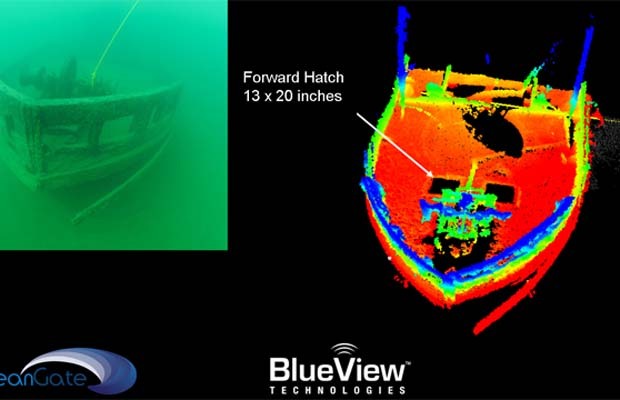 Edit: you can view a nice video of BluView and OceanGate’s sonar model of the wreck here.